​January 18, 2017 ​​“That is the nicest thing that anyone has ever done for me… ” These barely audible words issued forth as weak as frail branches in autumn trying to hold the heaviness of first snowfall. Words delivered from an 84 year-old gentleman in hospice where I was doing animal-assisted therapy (AAT) merged with clinical art therapy (AT) at the request of the patient’s family. Therapy dogs provide a healthy distraction from worry and create calming effects. Therapy dogs minimize anxiety while adding joyfulness whether petting or merely being in the presence of the animal. Therapy dogs have the ability to lower a patient’s blood pressure and heart rate. Therapy dogs mitigate worry and provide comfort. 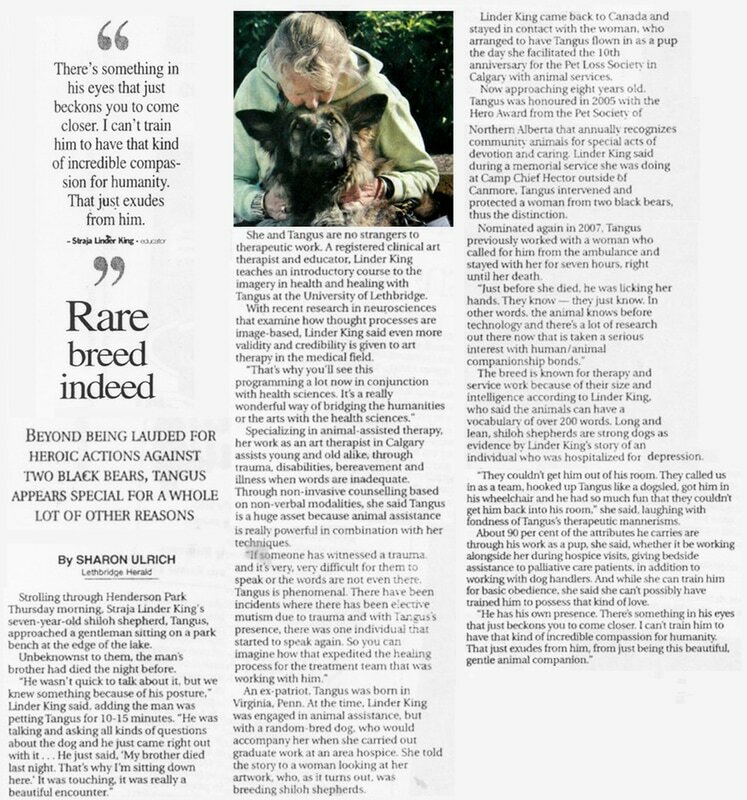 Many patients are reminded of their own wonderful experiences throughout life (reminiscence) surrounding animal companions. Most importantly the fear surrounding death mitigates and comfort is increased. Fear continues to be a major factor emotionally for both the palliative patient and surrounding family members comforting them. 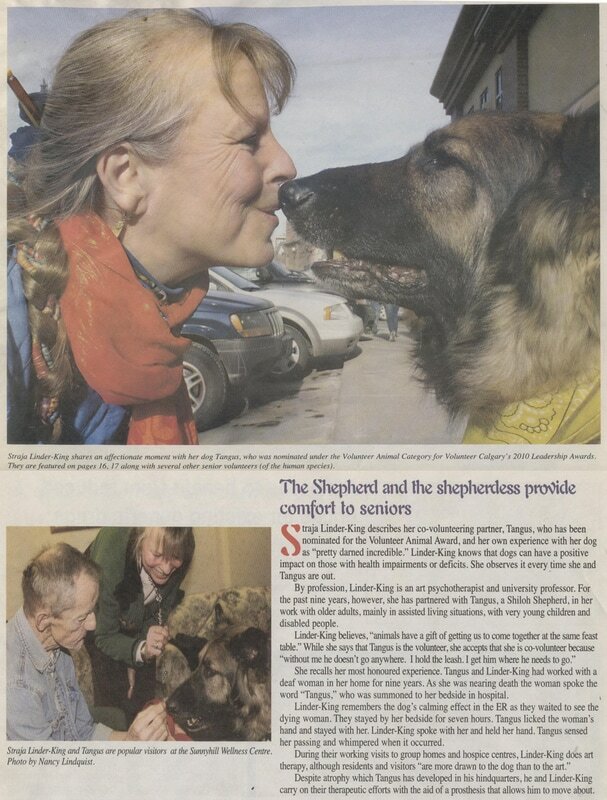 My working therapy animals have assisted the dying for many years now and as a team we have partaken in funerals, memorials, hospital trauma, and hospice work. As working dogs, they are foremost “emotional support” workers when assisting the dying. 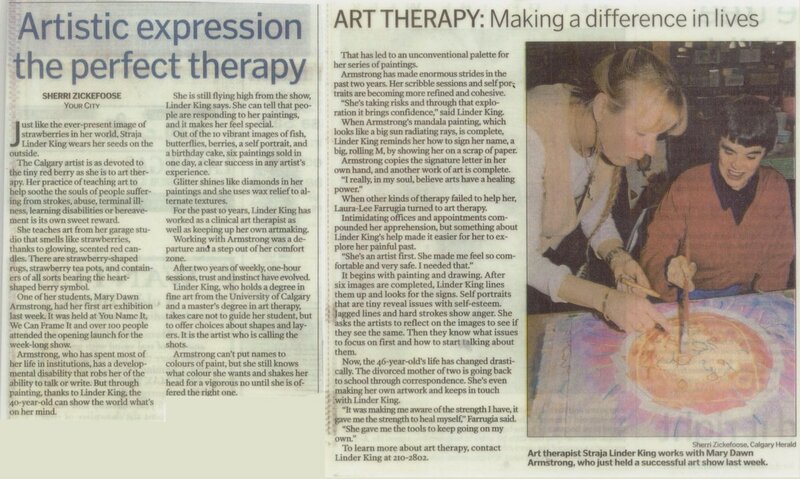 And the added art therapy (AT) is an effective method to process the complex emotions non verbally using art media/materials. Combining animal-assisted (AAT) therapy and art therapy (AT), both non verbal modalities, creates an intervention that is calming, comforting, and effective. And the family of the loved one has a tangible artifact or keepsake to encapsulate the experiences. Human animal bonds are ancient – much older than words. Seeing and the image also come before words. 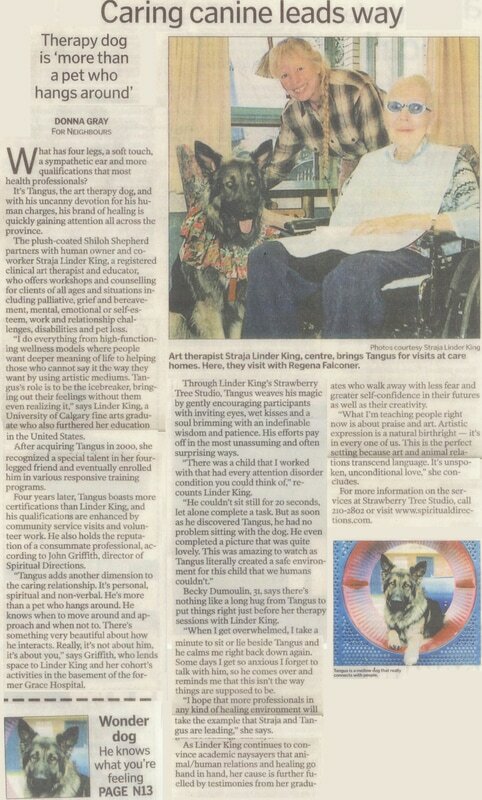 Animal-assisted art therapy provides a synergistic combination highlighting the power of the non-verbal, presence, and relationship. Art making brings us into relationship with the unique attributes of media, with the image itself and into the present moment of making. Our animal companions and therapy animals provide the same three qualities with one added incredible dimension, unconditional love. 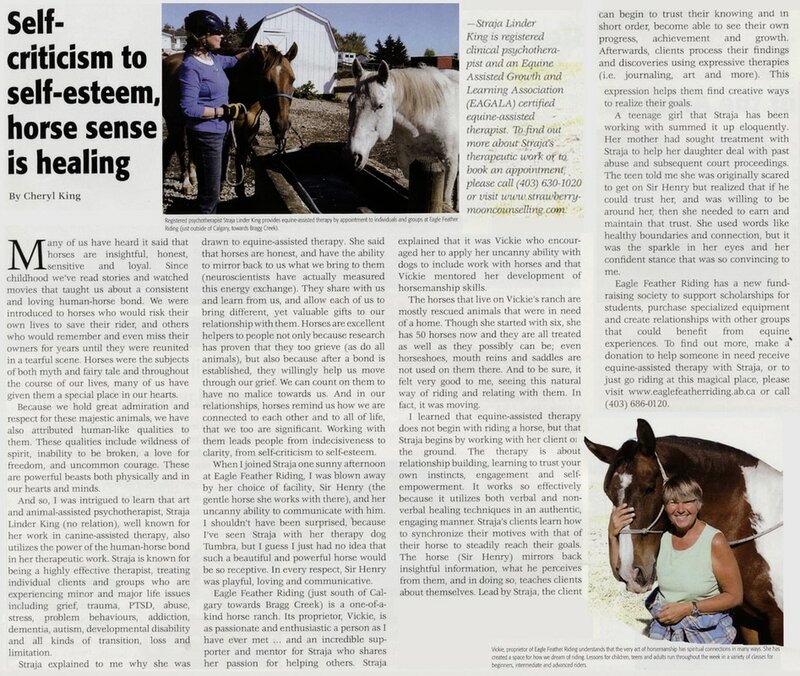 Animal-Assisted Therapy (AAT) is the coined phrase that is becoming more popular as the research pours into mainstream health literature and programs. 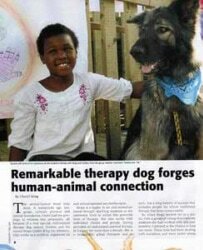 I witness the healing power of animals daily with my certified and registered therapy dogs, Twillow Rose and Tala Rain. 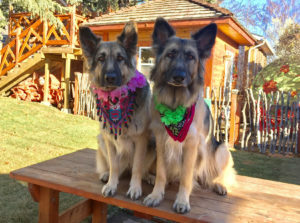 These two therapy dogs facilitate a safe haven around patients and family members that allows everyone simply to be present to all the feelings at any given moment. People are talented at masking their deeper feelings. That is not necessary with therapy dogs present. They have an incredible ability to “be with” whatever we are experiencing. Dogs will not take our sadness away and are willing to be with it as we work our way through the darker emotions. 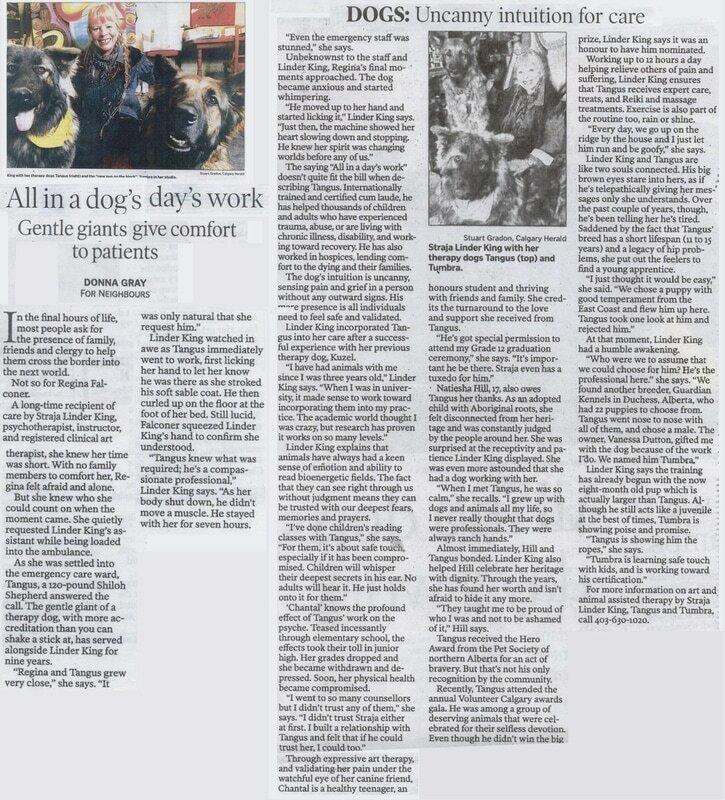 Therapy dogs, Twillow Rose and Tala Rain, assist people both physically and psychologically. 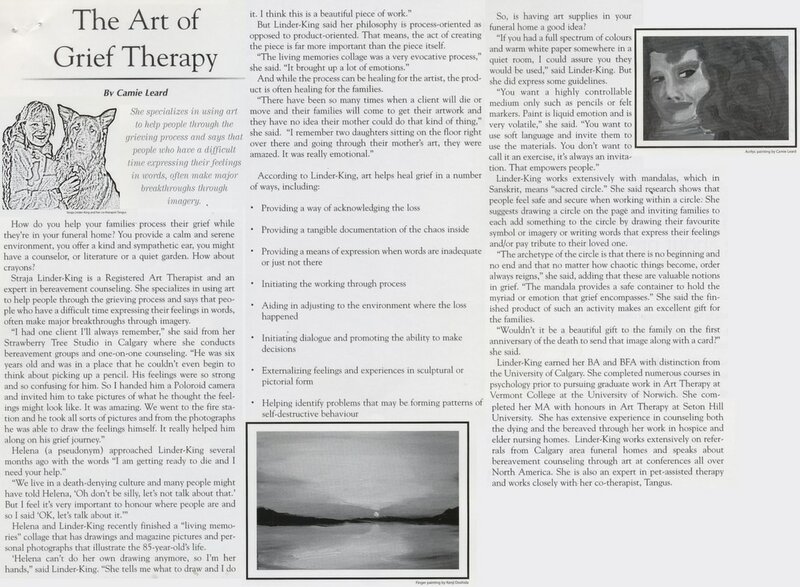 In my work as a clinical art therapist, I specialize in animal-assisted art therapy (AAT/AT). When words are not easily expressed or sometimes not even present, Twillow and Tala are incredible and professional assistants. They assist me in helping clients navigate their feelings non-verbally in a safe environment. Therapy dogs can help us with this notion whether in a group setting or individual visits. 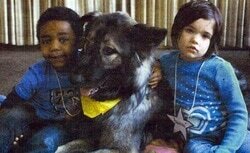 Therapy dogs, Twillow and Tala epitomize the relational heart of human animal bonds. Who can help us face the mystery and fear of dying? Animals. Animals do not demonstrate fear of mortality. In a mostly death phobic culture we need the raw presence and deep unconditional love of animals and nature. 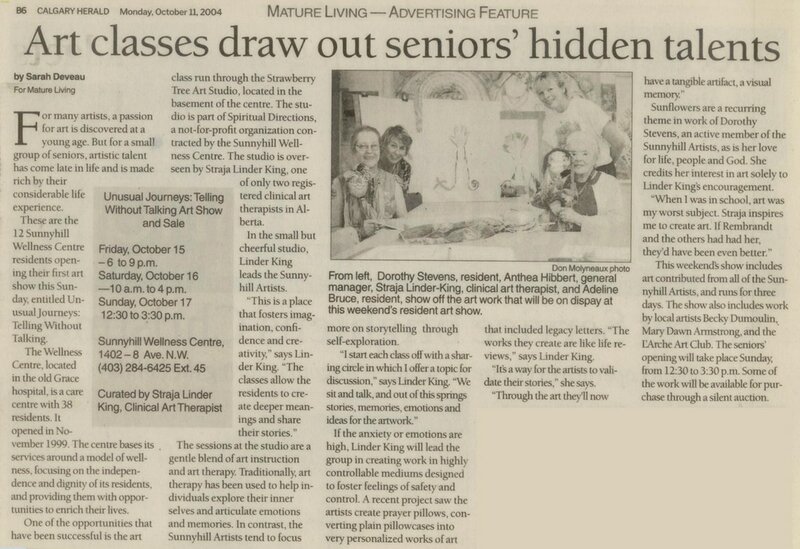 Straja Linder King, MA, ATR-BC, is a Board Certified Registered Clinical Art Therapist currently teaching at the University of Lethbridge, Alberta, Canada and holds a private practice at the Strawberry Moon Studio. Linder King is a printmaker, published poet/author and Animal-Assisted (AAT) (AAAT) © specialist. She has been designing art therapy programs, workshops and presentations both nationally and internationally for over 15 years. 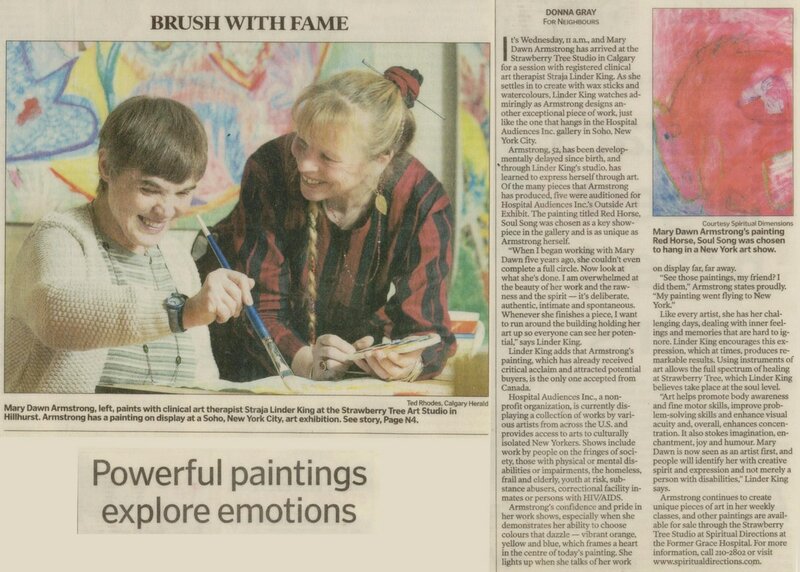 She holds a Master’s degree in Art Therapy and two bachelor degrees both ‘with Distinction’ in Fine Arts and Art History from the University of Calgary. 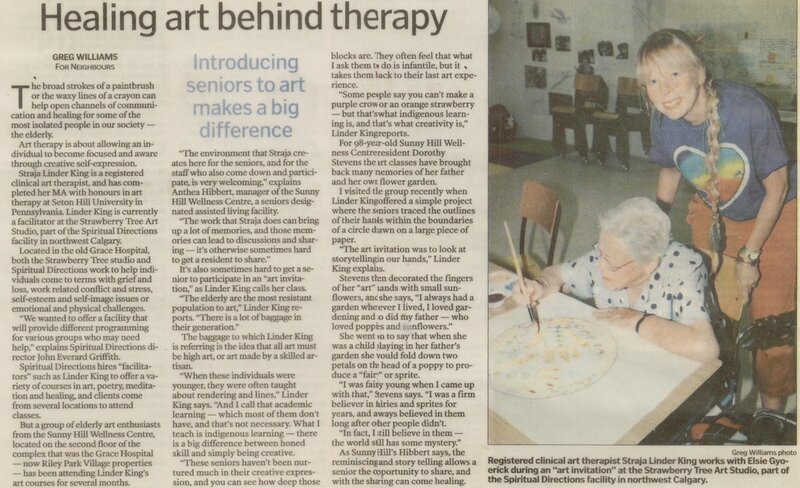 Linder King has pioneered art in healing from a spiritual/nature-based perspective in Alberta, Canada and does innovative work in health sciences, special education and gerontology. A guest of The Mustard Seed named Troy benefits from this profound connection. He is allergic to dogs, but this does not deter him from signing up to spend time with Twillow and Tala every time they come to visit. “These dogs are awesome. They make me feel so great and smart,” he says while grinning from ear to ear as Twillow gives him kisses on the cheek. Afterwards, Troy says he will be itchy and sneezing all night, but the happiness they bring him outweighs the annoyance of his allergies. 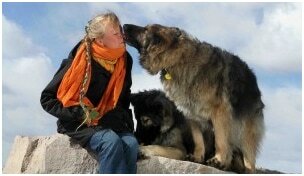 The human-animal bond is evident when you witness how these dogs lift the spirits of our guests. ​​“That is the nicest thing that anyone has ever done for me…” these barely audible words issued forth as weak as frail branches in autumn trying to hold the heaviness of first snowfall. Words delivered from an 84 year‐old gentleman bed ridden in the hospital where I was assigned pet therapy at the request of another patient. A twenty year‐old patient along with his family requested a visit from my two young therapy dogs named Twillow Rose and Tala Rain. And who was the other man? Well, the 84 year‐old gentleman just happened to be the young man’s roommate. This intergenerational match‐up was not planned and some gifts simply unfold that way. The nurse on duty removed the young man including all equipmen tethered to him. Together they made their journey safely to the quiet room to meet the therapy dogs. In the small quiet room the young man, his mother, the dogs, staff, and our working team all engaged in the pet therapy session. I should add that after our being in that designated space they may need to change the name. The quiet room was no longer quiet and sounded more like a crowd viewing a spectacular fireworks display with each trick completed by Twillow Rose and Tala Rain. Oh the joyful giggles and laughter. Of course the dogs lapped this up like their chicken broth at dinnertime. Did I mention that dogs smile? Well they do smile when they are working together and especially when onlookers cheer them through their repertoire. Afterwards, the head nurse of the unit begged us to please consider doing one more super quick visit with the dogs. This unplanned visit ended up giving us the greatest rewards. Imagine the joy that surfaced from this elderly man being surrounded by more than two hundred pounds of exuberance and wild tail wagging. Endless kisses and wet noses circling his bed. What joy to observe the aforementioned words found in the first sentence from this 84 year‐old patient. 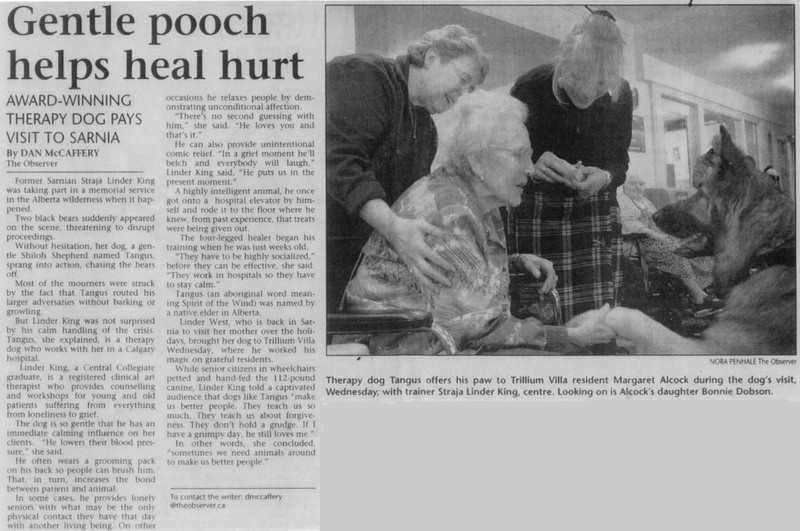 This is the power of human animal bonds or “pet therapy”. 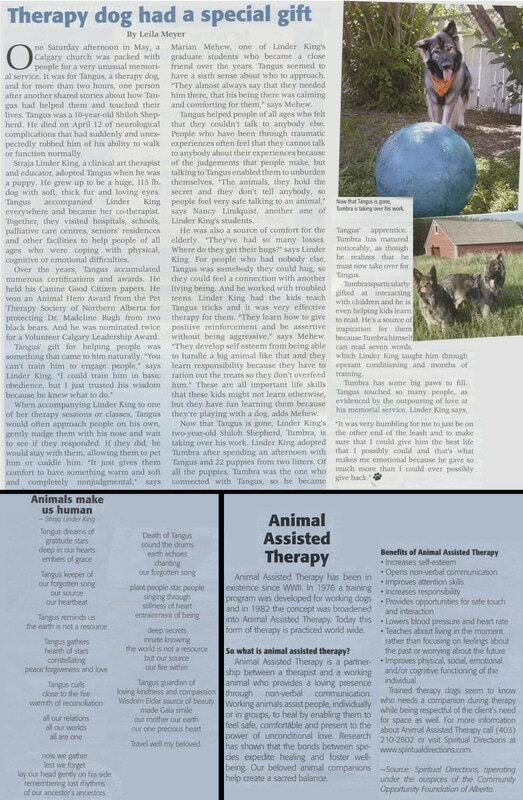 Pet therapy or Animal‐Assisted Therapy ( AAT) is the coined phrase that is becoming more popular as the research pours into mainstream health literature and programs. I witness the healing power of animals daily with my two certified and fully registered therapy dogs, Twillow Rose and Tala Rain ( CGN/TDI). These two gentle giants foster loving kindness and teach us through the gentle elements of play. Along with their compassionate ways one of the dog’s greatest gifts is their ability to simply be with the myriad of emotions at any given time. Dogs remain in the temporal state of presence. This allows them to actively engage and be with each and every emotions as they surface and unfold. Please make note that Twillow Rose and Tala Rain do NOT rescue, mask or fix anything. Well then what do they do you might ask? Therapy dogs facilitate a safe haven around them that allows us to simply be present to what we are feeling at any precise moment. They work in REAL time too. People are talented at masking their deeper feelings. That is not necessary with therapy dogs present. They have an incredible ability to “be with” whatever we are experiencing. Dogs are wonderful companions and deliver good medicine….the adage of “pet two dogs and call me in the morning” is funny and accurate. Dogs will not take our sadness away. Therapy dogs are comfortable and willing to simply be present to the sadness. And they are so attentive and patient while we work our way through the darker emotions.This authenticity or being “with our pain” is what pet therapy is about. Therapy dogs remain at our side enabling us to work through the “hard to talk” about emotions and unpleasant feelings. Feelings that are not serving our highest good and causing us unwanted stress. This is the alchemy of pet therapy. 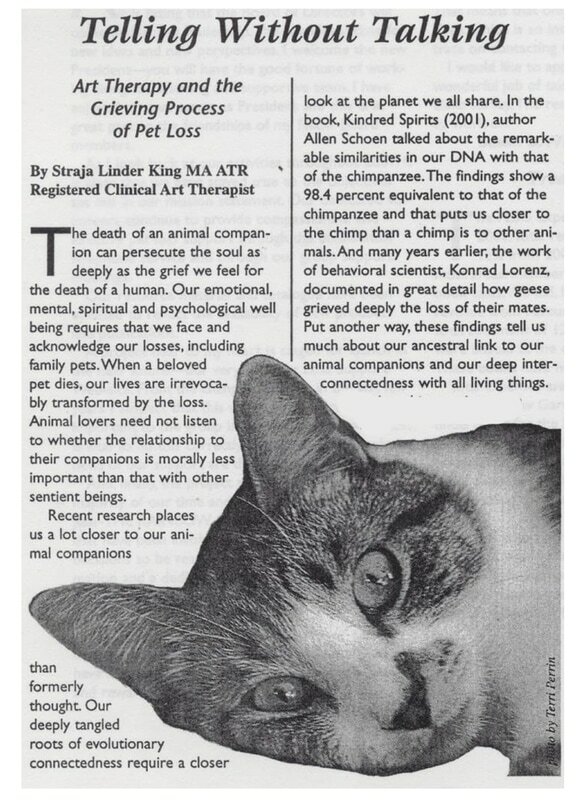 Ongoing research demonstrates how the bonds between human/animal species expedites healing and fosters well‐being. Both in research studies and in my own clinical work with clients, many of whom experience high blood pressure, the inclusion of animals has been shown to lower heart rate as well as reduce blood pressure. Our beloved animal companions help create a sacred balance. This sacred balance is living harmoniously, relaxed, and purely makes us feel better. 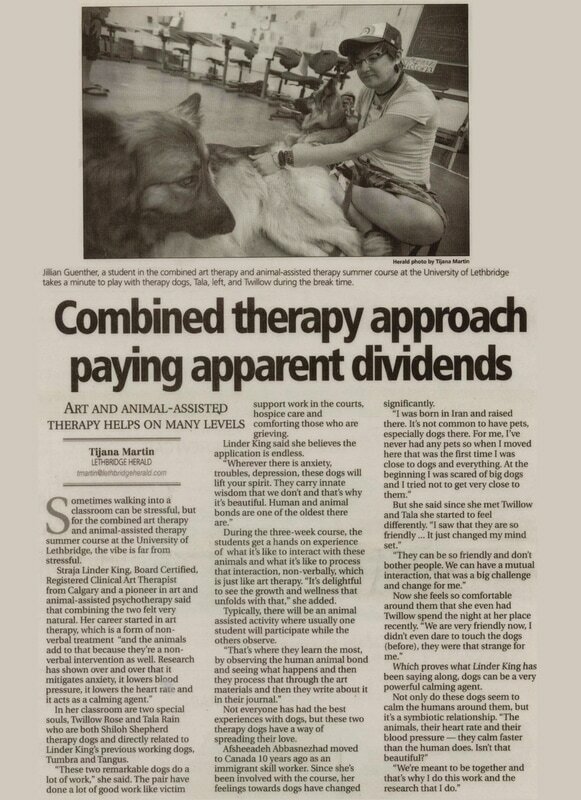 Major benefits of animal assisted therapy ( AAT) are the animal’s ability to mitigate our anxiety while bolstering our happy hormones such as oxytocin and endorphins. All this without even having to touch them! Yes that is right …you merely need be in their wondrous presence to soak up their humour, and loveable antics. All combined to easily add sunshine to the dreariest of days. Their unconditional love and joy can light up the darkest corners. Twillow Rose and Tala Rain assist people both physically and psychologically. 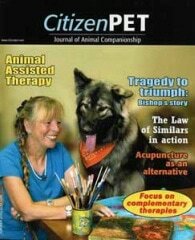 In my work as a clinical art therapist, I specialize in animal‐assisted art therapy ( AAT/AT). When words are not easily expressed or sometimes not even present, Twillow and Tala are incredible and professional assistants. They assist me in helping clients navigate their feelings non‐verbally. A good example is grief. Grieving clients are kept in the present moment and can feel safe with the presence of Twillow and Tala at their side.Therapy dogs create a safe environment that allows the client to safely address each and every emotion as they unfold. As humans we can easily turn reflecting on the past to regret and turn uncertainty of the future into worry. Both are not helpful knowing that all we really ever have at any given time is the present moment. Therapy dogs are a gentle reminder of how vital being present can be on our wellness journey. Therapy dogs can help us with this notion whether in a group setting or individual visits.When working with groups or individually, both Twillow and Tala have an uncanny ability to know who needs their attention most. These warm canine companions have a built in heart tracker and instinctively go to those needing their healing affections most. You cannot train a dog to like people. When the dogs are puppies they go through numerous testing to see if they demonstrate a propensity for their therapy work. 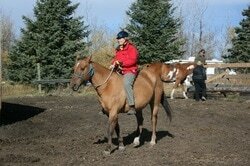 Then the actual training starts from that point and continues throughout their life span. This is the beauty of a working bond.We have an inherent need to be connected with all life. This need is termed “Biophilia” from the Greek words for life (bio) and for loving (phil). This is not about sentimentality; it is a core recognition that all humans have a biologically based bond to the more than human world. The animal-human bond runs deeps. It transcends age, language, cultural, physical and mental boundaries. ​A dog helps his owner with counselling. CMT Television's "Pet Heroes" Television Show - April 2011. 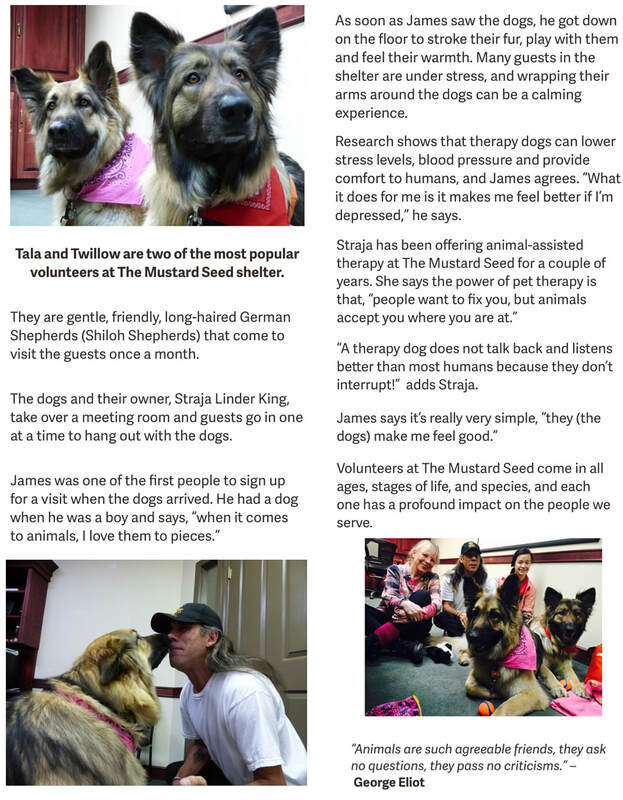 Straja's certified therapy dogs, Tangus and Tumbra were profiled as real-life heroes on the CMT television show "Pet Heroes". 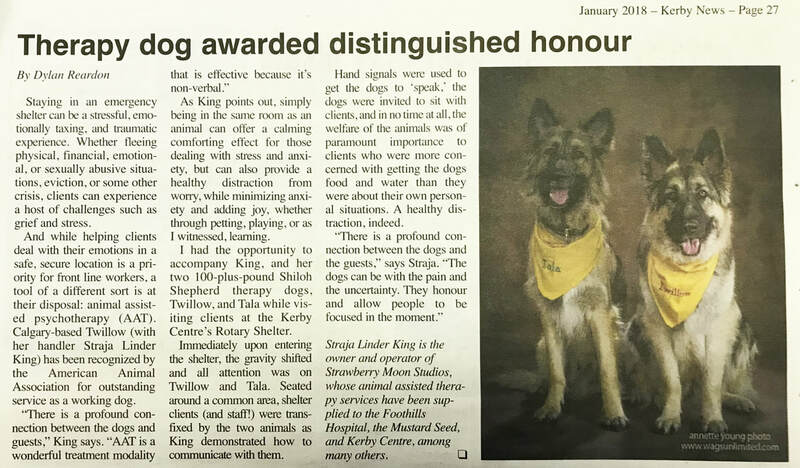 The internationally broadcasted show profiled both of Straja's well-trained, well-mannered canines for their outstanding contribution to her therapeutic work and for their many hours of volunteerism in the community. Tangus even helped save someone from being attacked by two black bears... the showed aired as the final episode of the 2011 season. 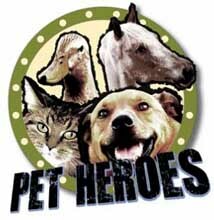 Video clip currently unavailable because it is still airing on CMT "Pet Heroes"
Think Your Dog's Smart? 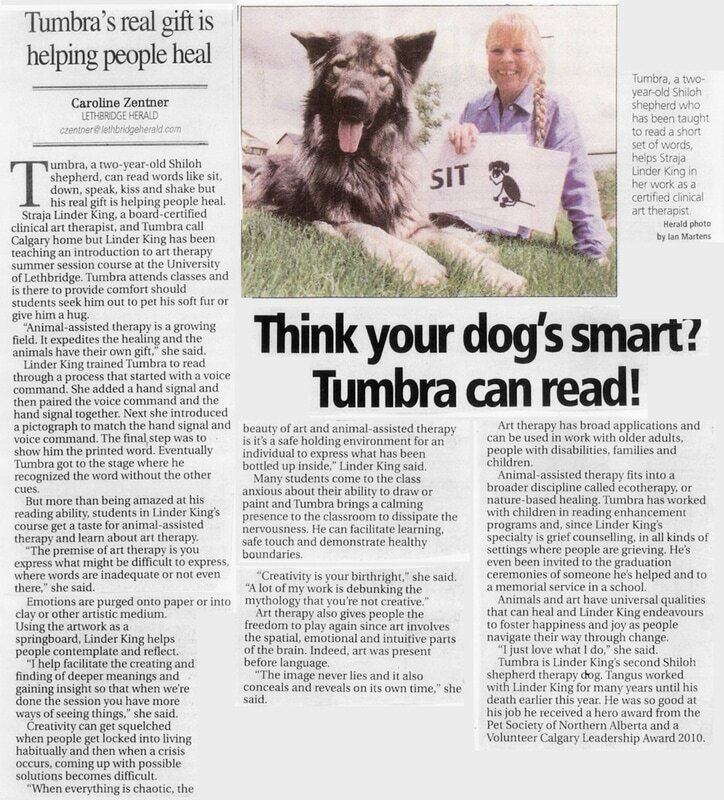 Tumbra Can Read. 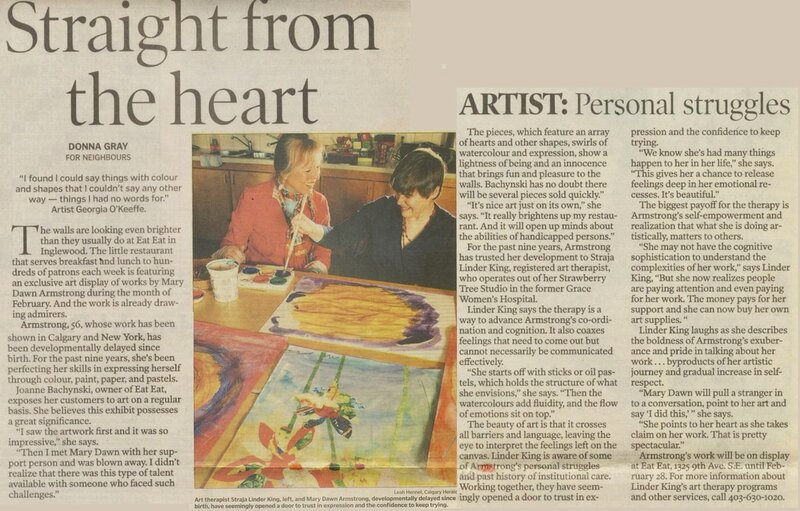 ​​Lethbridge Herald - July 31, 2010. 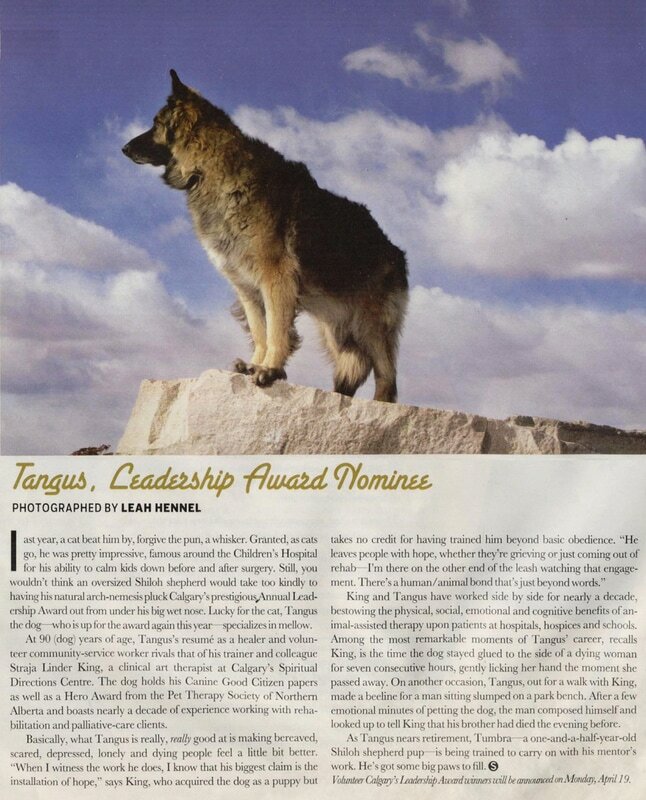 ​Volunteer Animal of the Year, Leadership Calgary Award - Tangus was nominated in 2010. 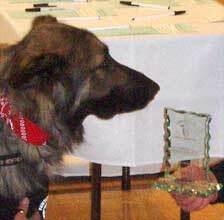 Volunteer Animal of the Year, Leadership Calgary Award - Tangus received the award in 2009 (Photo). Keep in mind that he didn't drive himself to volunteer all over our community. 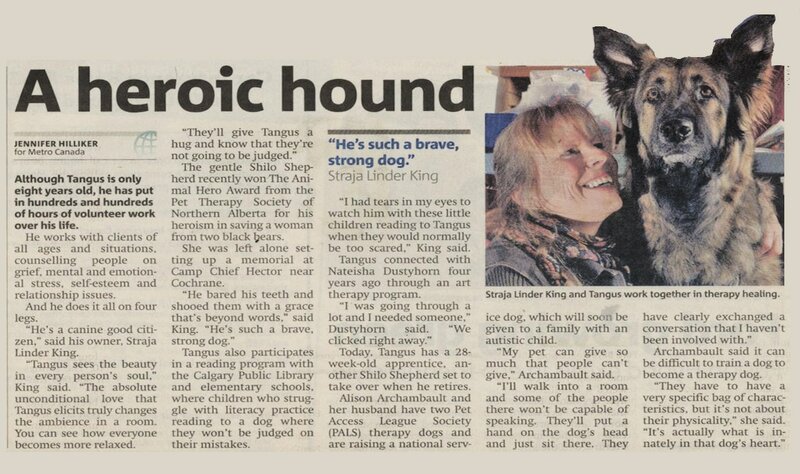 Heart of the Hero Award - Tangus was recognized by the Pet Therapy Society of Northern Alberta in October 2005. What has four legs, a soft touch, a sympathetic ear and more qualifications than most health professionals?